Cutnell and Johnson’s Physics has been the #1 text in the algebra-based physics market for almost 20 years. 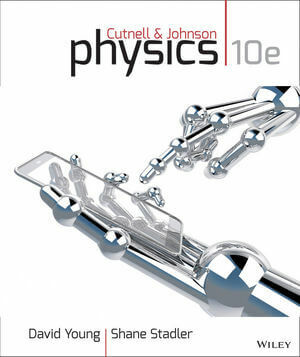 Physics, 10th Edition brings on new co-authors: David Young and Shane Stadler (both out of LSU). The Cutnell offering now includes enhanced features and functionality. The authors have been extensively involved in the creation and adaptation of valuable resources for the text. The 10th edition includes 160 New Chalkboard videos, guided online tutorials in every chapter, and vector drawing questions. All of these features are designed to encourage students to remain within the WileyPLUS environment, as opposed to pursuing the “pay-for-solutions” websites that short circuit the learning process. John D. Cutnell is currently Professor Emeritus in the Department of Physics at Southern Illinois University, Carbondale. Kenneth W. Johnson is currently Professor Emeritus in the Department of Physics at Southern Illinois University, Carbondale. 160 New Chalkboard videos (authored by David and Shane) are short (2 – 3 minutes) videos that guide the student step-by-step through a practical solution, similar to what the student might see during office hours with his or her professor. New GO (Guided Online) Tutorials in every chapter (authored by David and Shane). The GO tutorials use a guided, step-by-step pedagogical approach that provides students a low stakes environment for practicing their problem-solving skills. Vector drawing questions. One of the most important techniques developed in the text for solving problems involving multiple forces is the free-body diagram (FBD). Many problems in the force-intensive chapters, such as chapters 4 and 18, take advantage of the new FBD capabilities now available online in WileyPLUS, where students can construct the FBD’s for a select number of problems and be graded on them. ORION provides an adaptive pre-lecture tool that assesses students’ conceptual knowledge so they come to class better pre­pared, and a personalized study guide that helps stu­dents understand both strengths and areas where they need to invest more time, espe­cially in preparation for quizzes and exams. All of these features are designed to encourage students to remain within the WileyPLUS environment, as opposed to pursuing the “pay-for-solutions” websites that short circuit the learning process. WileyPLUS is a research-based online environment for effective teaching and learning. WileyPLUS is packed with interactive study tools and resources–including the complete online textbook–to give your students more value for their money. With WileyPLUS, students will develop a conceptual understanding of physics: Conceptual Examples, Concepts & Calculations, Focus on Concepts homework material, Check Your Understanding questions, Concept Simulations (an online feature) and more.